Excerpt below - Fill out the form to download the complete case study as a PDF. HomeVisit established itself in 2000 as a photography and videography service provider to real estate professionals. Prior to 2014, their core business was comprised of HomeVisit’s fusion photography and slideshow “virtual tours” - curated slideshows of still images, video, and floor plans. 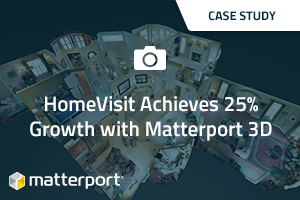 After discovering Matterport at a local trade show in 2014, HomeVisit founder Bryan Vaughan recognized the huge revenue potential behind the game-changing technology. HomeVisit capitalized on a unique opportunity to be the first in its market to offer 3D scanning as a service to real estate clients, using it as an opportunity to lead in technology innovation and own the conversation. In order to capitalize early in this untapped market, HomeVisit bought a Matterport camera in 2014 and decided to pitch the 3D service to upsell existing accounts. As the first in their market to offer this service, they knew the struggle would be to educate HomeVisit’s existing real estate clients on the value of a new piece of technology and give them the confidence that the process would be easy, affordable and successful. HomeVisit would also need to scale with the inevitable demand for 3D services. HomeVisit introduced Matterport by highlighting one of its star luxury clients - the Creig Northrop Team, Maryland’s #1 top agent team according to REAL Trends. HomeVisit partnered with the Northrop Team to capture their entire listing inventory in immersive 3D, and make it a standard part of their listing presentation. With Matterport in their pocket, they saw higher win ratios and attracted more buyers. HomeVisit grew the account by dedicating a resource entirely to servicing the Creig Northrop Team, so that they could rapidly integrate 3D across their marketing. They now dedicate 3-4 photographers exclusively to this account. Implementation for this effort was a smooth process to due to quick training on Matterport’s simple, automated platform so that they could scale as other clients adopted 3D services and generate superior 3D spaces immediately. HomeVisit has over 10 cameras in operation in multiple markets with steady and growing adoption across all of it’s real estate brokers and agents. HomeVisit also realized that a critical component of the equation was getting Matterport’s game changing new 3D technology in front of Buyers on the Internet. To that end, HomeVisit developed a best of breed, fully responsive property website solution featuring Matterport 3D models, fusion photography, video and floor plans. To learn how HomeVisit achieved 25% growth, download the rest of the case study.